The hospital shop has had some odd snacks show up over the years. 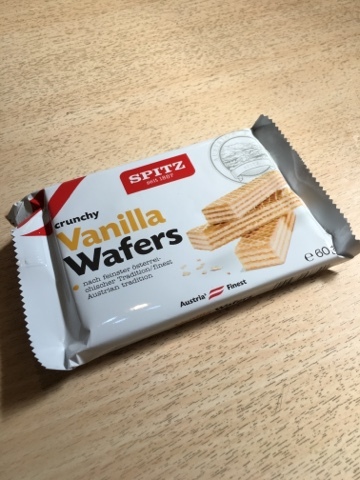 This is a particularly angular choice, Austrian wafer biscuits. While I admit that the best Eurowafers come from the continent, most of the success is due to the sheer variety of toppings and fillings. The best English wafers are the Pink & White ones that are - essentially - vanilla wafers like these. At a pound for a pack of 6 they aren't that cheap, so let's see if they are worth the trip. Upon inspection these are a slightly less crumbly version of the Pink & Whites but with essentially the same flavour. A quick glance of the ingredients reveals that they are essentially sugar and oil too. Hardly diet compliant! And as with all of these kinds of biscuits that lack a topping they just aren't filling. They don't flip the nutritional off switch, and conversely act rather well as an incentive for me to cook and eat something decent! The also have a chocolate version, which may be worth a look. 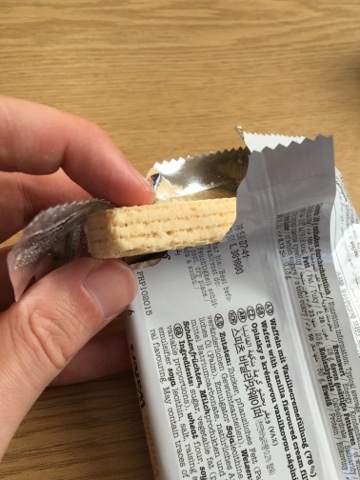 As they aren't really filling or that great for you its a pretty hard sell, but as I do enjoy Eurowafers (for all their flaws) it's almost certain to happen.